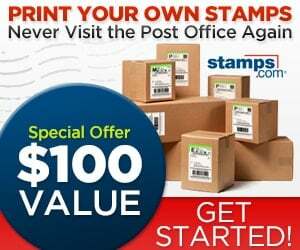 Stamps.com is one of our sponsors and has provided us with a great deal. Our fans can get this great offer by using our Stamps.com Promo Code. When you use one of our promo codes you are directly supporting our podcast and site. Thanks for your support. Use your Stamps.com Promo Code MMA to print postage from your house and never go to the Post Office and wait in a long line again. Click and instantly buy and calculate postage. Print postage on labels, envelopes or plain paper. Affix postage and mail anywhere in the world. You will save a bunch of time by using your Stamps.com Coupon Code MMA and printing your postage online. Use your own computer and printer. You will get the lowest rates available and have access to all USPS mail classes and services including international. Avoid time consuming trips to the Post Office. Stamps.com is open 24/7. Exact postage the instant you need it with your Stamps.com Promo Code. Stamps.com is a great place to buy postage online. No more guesswork. Just place your letter or package on the Stamps.com scale (free with every account) and the exact weight is sent to the software. Then select the mail class and Stamps.com will instantly calculate and print the correct postage amount. Stamps.com will also help you choose the best mail class based on price and delivery time. Shipping products? You and your customers will love our comprehensive shipping features. Use your Stamps.com Promo Code MMA to make shipping and e-commerce made simple.